When the first-generation Nissan Leaf debuted in 2011, it quickly became the best-selling electric car in history, with no real competition. 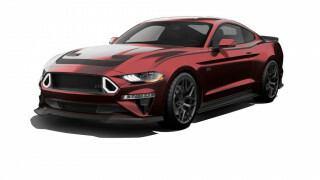 By the time the most recent version debuted in 2017, it was nearly outdated before it left dealers’ lots due to a shorter range than rivals from Tesla and Chevrolet. The biggest issues with the first-generation Leaf involved low range and the lifespan of the battery pack. 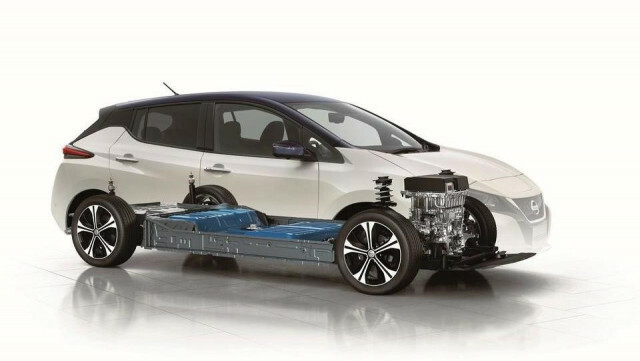 After experiencing higher problems with its battery pack than other electric cars in the first generation Leaf, Nissan has focused attention on the battery pack in the new model, so we dug into what has changed and how the new pack stacks up to the competition. To improve the range, Nissan has almost doubled the Leaf’s battery capacity from 24 kwh (and 30 kwh in the last models) to 40 kwh in a package with the same volume as the first-generation car. It has 67 percent more capacity and a 37 percent higher output compared to the 2010, though it’s just 0.9mm thicker. This is a 33 percent increase from the 2017 vehicle. 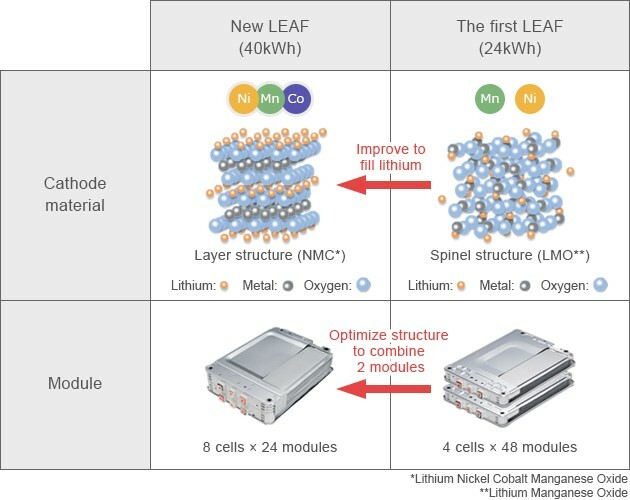 The nickel manganese cobalt cells Nissan uses in the latest 40-kwh Leaf battery pack use a new layered molecular spinel structure that is cheaper and delivers more power than the lithium manganese oxide cells in the original Leaf battery. The battery still has 192 cells but they are arranged in 24 modules of eight cells each, rather than 48 modules of only four cells. 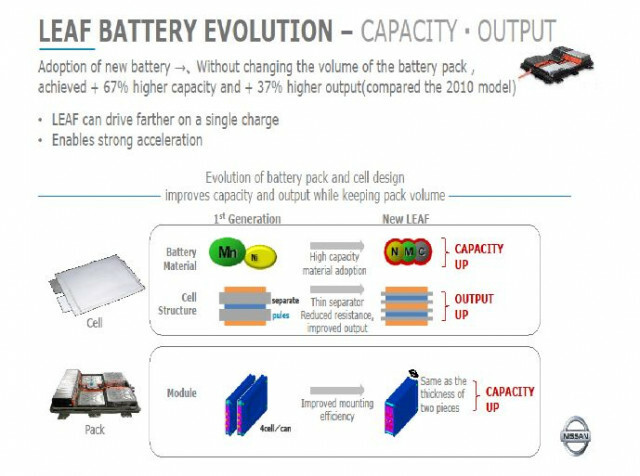 The pouch construction of the new battery creates fewer hot spots compared to other cell construction methods, Nissan says. A single-layer pack with laminated cell structures keeps the modules cool, Nissan says, despite doubling the battery’s capacity and output. The company has not modified the cell monitoring, or cooling systems, which has been a key concern for some observers, who worry that the new pack may not last any longer than the originals. As we reported in April, Nissan slows down charging time if the car is fast-charged multiple times. Nissan says this significantly reduces battery degradation, though some customers have complained that it also significantly lengthens the time needed to make long-distance road trips.